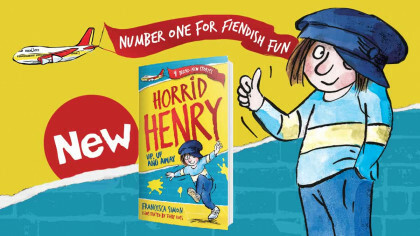 Go globetrotting with Lonely Planet Kids’ new Around The World in 50 Ways book! From tuk-tuks and sleds to steamboats and hot-air balloons, explore the world like never before with Lonely Planet Kids‘ Around The World in 50 Ways book! 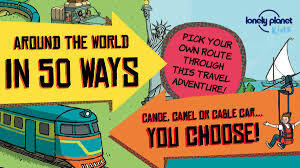 In this choose-how-you-travel adventure book, you get to pick your route and transport, then set off from London and travel across the globe! Will you ride the slow boat to Chiang Mai, take the bullet train from Tokyo, or ride the Airbus A320 to Moscow? Welcome to the Tower of London! That’s the starting point of this amazing adventure, but what’s the next leg of the journey? That depends on the transportation chosen! You could take Eurostar by turning to page 40, a boat by turning to page 8, or take the coach to Toronto by turning to page 122! Once aboard, discover all about these amazing machines and how they work. When you arrive, explore the local area and see what makes it so interesting and unique! Your goal is to make it all the way around the world from London and back. Lonely Planet Kids is all about the exciting and amazing world around you! Drawing on their huge team of global experts, Lonely Planet Kids combines astonishing facts, quirky humour, and really cool images so that you can come on an adventure to discover our planet! For grown-ups, The Lonely Planet Kids newsletter is full of family travel inspiration, news about books and competitions, and has fun activities for young explorers. Sign up now and receive 30% off your next Lonely Planet book!